SAN FRANCISCO - AUGUST 25: A new electric vehicle charging station is seen near San Francisco city hall August 25, 2010 in San Francisco, California. A state board has approved $10 million in tax credits for an electric vehicle company promising to add more than 900 jobs in San Jose and San Francisco. The board of California Competes considered the credit for NextEV USA among $47 million taken up at its meeting Thursday to encourage job creation. It's the third tax credit Gov. 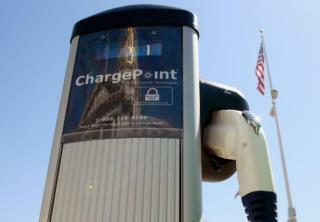 Jerry Brown's Go-Biz board has approved in the hyper-competitive electric car market. It previously approved $15 million for Tesla and $10 million for Faraday Future. NextEV attorney Paula Brown tells the board the company plans to begin selling its first commercial vehicles in China next year. The California jobs will be in research and development, many in engineering, but Brown says the company has not decided where to base its production.